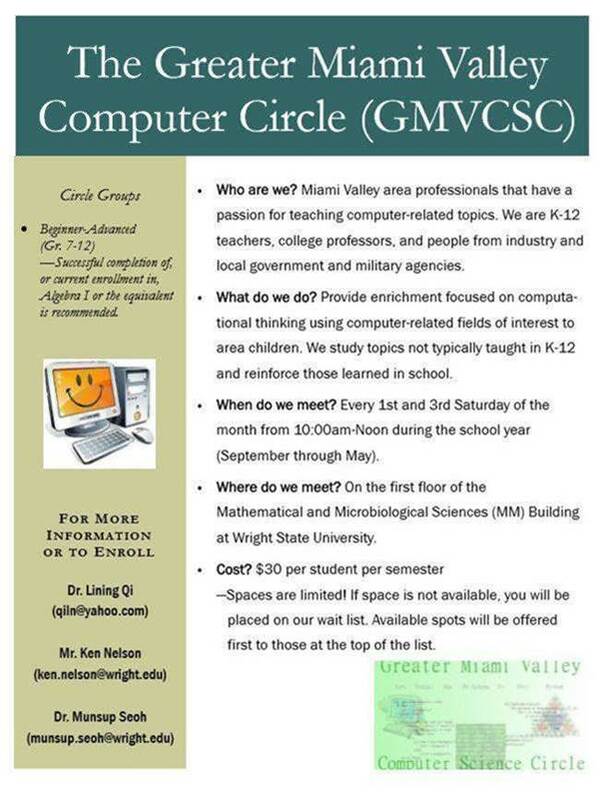 The Greater Miami Valley Computer Science Circle (GMVCSC), in its 3rd year of operation, is an organization dedicated to helping the students of the Miami Valley and beyond. Our Computer circle focuses on computational thinking and problem solving. We use Python/Java/HTML to teach concepts like Algorithm design, Web design, Mobile apps, Robotics, and Information Security. We currently only have 1 class level, as we get more instructors we will try to break out into beginning and intermediate/advanced classes. The GMVCSC is open to 7-12 graders who have had at least Algebra 1. Faculty come from local school districts, area colleges and universities, private industry, local government. We have students from all over the area and beyond; we are truly a “Greater Miami Valley” organization! We meet from 10:00am-Noon the 1st and 3rd Saturday of the month during the school year (September-early May) in the Mathematical and Microbiological Sciences (MM) Building on the campus of Wright State University. If you would like to inquire about joining one of our groups, please contact either Mr. Ken Nelson (at ken.nelson@wright.edu) or Dr. Munsup Seoh (at munsup.seoh@wright.edu). Spaces are limited! If there is not space for your child at the time you email us, then you will be placed on our waiting list. Available spaces will be offered to those on our waiting list first, with priority given to those on the list longest. If you or someone you know, would be interested in volunteering with our organization, then please let us know as well! We will be happy to talk with you and see where your skills and talents can be best used! Lastly, please let us know if you have any questions and see the flyer about our group copied below. Please share it with anyone who would be interested! We thank you in advance for reading this letter and wish you well! http://mpen-ohio.net/wp-content/uploads/2018/01/GMVCSCflyer.jpg The Greater Miami Valley Math Circle (GMVMC), on planning its fifth year of operation, is an organization dedicated to helping the students of the Miami Valley and beyond. Our math circle focuses on mathematical enrichment and problem solving while also providing a few competition opportunities. We have three levels: Beginning (Grades 5-7), Intermediate (Grades 7-9), and Advanced (Grades 9-12 with completion of Algebra I). Faculty come from local school districts, area colleges and universities, private industry, and local government. We have students from all over the area and beyond; we are truly a “Greater Miami Valley” organization! We meet from 10:30am-Noon every 2nd and 4th Saturday of the month during the school year (September-early May) in the Mathematical and Microbiological Sciences (MM) Building on the campus of Wright State University. Enrichment topics include age-appropriate treatments of logic and proof, geometry, number theory, combinatorics, algebra, statistics, and more. We cover topics not usually seen in school mathematics and reinforce and explain things learned in school as well. Competition opportunities include the American Mathematics Contest 8th Grade Test (AMC 8 Test) for our younger students each fall and the Ohio Mathematics Contest (OMC) for all of our students each spring. If you would like to inquire about joining one of our groups, please contact either Mr. Erik Potts (at erik.potts@wright.edu) or Dr. Munsup Seoh (at munsup.seoh@wright.edu). Spaces are limited! If there is no space for your child at the time you email us, then you will be placed on our waiting list. Available spaces will be offered to those on our waiting list first, with priority given to those on the list longest. And, if you or someone you know would be interested in volunteering with our organization, then please let us know as well! We will be happy to talk with you and see where your skills and talents can be best used!